Glenn Irwin on the PBM Be Wiser Ducati at the North West 200. Glenn Irwin has only managed 11 laps in practice on the PBM Be Wiser Ducati, but the British Superbike protagonist will line up on the front row of the grid at the Vauxhall International North West 200 today. The Carrick man is entered solely in the Superbike class on the exotic 1199 Panigale R and has not had the benefit of plentiful laps around the 8.9-mile course compared to his rivals, but the 27-year-old clocked 121.556mph on Thursday to qualify in third place. Irwin was only 2.3 seconds down on 13-time winner Michael Rutter’s pole time set on the Bathams SMT BMW and half a second behind 18-time winner Alastair Seeley (Tyco BMW) on a big-hitting front row. He is making just his second appearance at the event following his debut in 2015 and lines up today in a Superbike race at the North West for the very first time. Already, Irwin has exceeded expectations given the lack of track time he has had throughout practice week, with Tuesday’s session reduced after a red flag incident in Supersport qualifying caused a lengthy delay, while Thursday’s session was stopped with 21 minutes to go after John McGuinness crashed at Primrose. Nonetheless, Irwin goes into today’s two seven-lap headline races on the north coast as a major podium contender. However, he is also dreaming of becoming a NW200 Superbike winner at his first attempt. The popular Ulster rider fondly recalls Michael Rutter’s Superbike victory on the NW200-branded Ducati in 2008 and says he would love to emulate the English rider by putting the Italian bike on the top step. “Michael Rutter won on a Ducati pretty recently and I’m aware of that because I was cheering him on that day! We get on well and that’s one of my memories of growing up with a kid – watching Michael on the Superbike,” Irwin told the News Letter. “I was in awe of him and the noise of his bike because he was always so fast and I always admired him. I always wanted to ride a Ducati and I remember getting on the podium at Thruxton last year and thinking, ‘I actually am riding a factory Ducati now’. Irwin acknowledges that he faces a massive challenge if he’s to come out on top today, but he is a rider in red-hot form coming off the back of some terrific rostrum results in BSB. “I respect everyone out there and seven laps is going to be tough going,” he said. 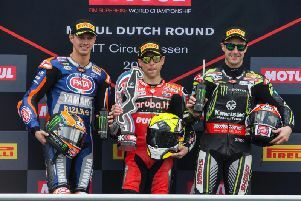 “But my tyre management is quite good and the Ducati seems to be a strong package at the end of races, so hopefully that will be the case again here. Along with Rutter, Tyco BMW rider Seeley is one of the big favourites on the S1000RR and won the Superstock race on Thursday in commanding style. Michael Dunlop will also hope to force his way into the mix after qualifying in fourth place on row two on the Bennetts Suzuki. Peter Hickman (Smiths BMW), Martin Jessopp on the Riders Motorcycles BMW and Ian Hutchinson (Tyco BMW) also look poised to challenge at the front in the blue riband class.